This gun has a heavy two-gallon backpack to store the water in, but the gun itself is very light and well designed. It also has four nozzle settings for you to choose from, 5x, which gets the farthest range, 10x, which has a good balance between power and range, 20x, which gets about a 10 foot range, but can soak anything within the range instantly, it also has tons of power. And then, there is the 'blast' nozzle, which is completely usless because, unlike shooting one strait stream, it shoots three, yes, that's right, THREE separate shots, one goes up, and one going left and one right, the only use this nozzle has is to show off the gun to all the little kids in the neighborhood. The good things about this gun is that it has a pressure gauge, and it's one of the last guns ever to use a Cylindrical Pressure Chamber(PC), which gives more power. The bad things about this gun is, the straps on the backpack, they are really small and thin. 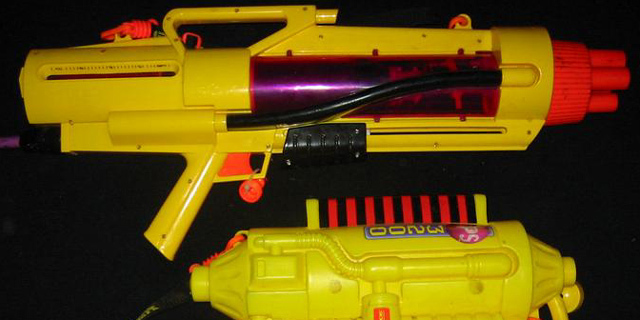 The color is another thing, the whole gun is bright yellow, which doesn't help at all during a water war. This gun does come at a price, new, this gun was $40 dollars, but you might be able to find it on eBay for just under $30 dollars. I'd highly recommend this gun for anybody who is an HWO. This is a great backpack soaker. The backpack can hold roughly 2 gallons of water, the only drawback of that being that it is hard and uncomfortable. You could make better straps to make it more comfortable or put it in another backpack. The gun itself is lighter than I expected and contains a huge PC. The PC is longer than any other cylindrical one I've seen! This allows you to have an advantage in shot time, especially on the smaller nozzles. The nozzles are rated 5x, 10x, 20x, and Typhoon. Typhoon is like a fan blast, only it sprays out 3 5x streams. Contrary to popular belief, when you use Typhoon water does not shoot out of all four nozzles! It also is useful if you are being overwhelmed with enemies and it has good shot time. 20x gives out a ton of water, but the shot time is only a second or two. The 5x and 10x are my favorite nozzles due to the range and shot time. They are also overly hyped up, the 5x DOES NOT shoot for 8 seconds as I've seen claimed on Ebay and Isoaker! Shot time is about 5 secs for 5x and 3 secs for 10x. These nozzles still have a huge shot time advantage over many other CPS class weaponry. Many complain about the 3200's colors, but If you don't like them then paint your gun. The loud yellows and oranges can be tamed with a little black and green spray paint. This gun does take a lot of pumps, 35 to full. The large pc will yield more than 10 "tap shots" before you run out of pressure, so that is the wise way to shoot with the 3200. The 3200 can be expensive, but I picked up 2 for only $20 each, so shop/bid wisely. I would recommend this gun for almost any position. The exceptions are: sniper as the max range does not exceed 45ft, and light troops, as the backpack limits some mobility. The 3200 will keep you ahead in the battle with its great power and water capacity. This is a soaker that I do not recommend. It has great water capacity, which is kept in a two-galloon hard backpack. One of the many things that disappointed me about this soaker was that the straps on the backpack were so small and the hard backpack often presses against your back, not a good feeling. You can put the backpack in another backpack, though. This soaker has four nozzle settings, and I prefer 20X. This soaker takes way too many pumps to pressurize. The range and power of the CPS 3200 is awesome. My CPS 3200 leaks where the backpack connects to the soaker. I do not believe that the CPS 3200 is worth its price. The colors are a bad yellow which will give away your location. Larami did include a strap, but it does not help much.